Ponchos are usually made with bright colors and patterns. 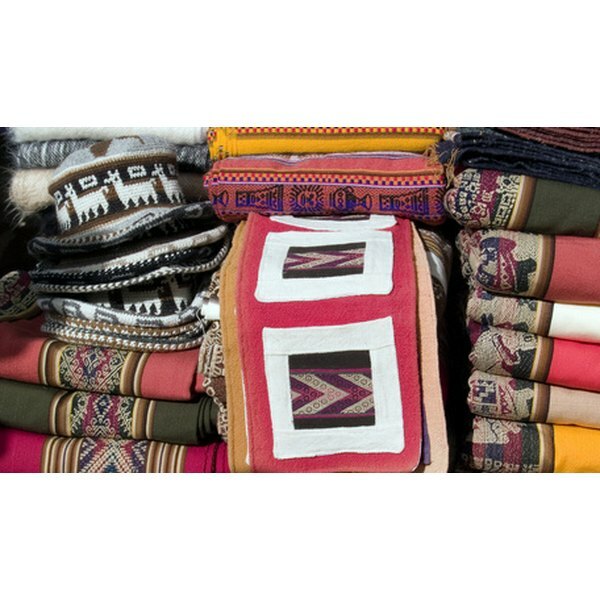 Originating from Mexico, ponchos are pieces of clothing typically made from a warm blanket or a loose knit fleece. Ponchos are available around the world in every color and shape imaginable. Making a no-sew poncho out of fleece is quick and easy; alternatively, choose a piece of fabric and make a stylish poncho with minimal sewing or cutting. Lay the fabric flat on a large surface or on the floor. Fold the fabric in half, so the edges meet. Measure the fabric along the center line. Draw a cross where the middle point is. Measure each side of the cross to make sure they are the same. If you want a short poncho, cut each side to the desired length. Medium-length ponchos typically measure 22 inches per side. Measure straight across the top of the material where the cross is. Draw a line six inches long. Cut along the line to make the hole for the head. Cut a 3-inch slit along the front of the neck hole for the center. Try the poncho on. If you want it to be shortened, adjust the length; if you want a bigger neck hole or an off-the-shoulder style, make the hole bigger. Thread the needle. Hem all the way around the edge of the poncho using a hemming stitch to prevent the material from running. Knot the threat and cut it. Hem the neck hole in the same way. Attach ribbons or buttons to decorate your poncho.